And now, dear patient listeners, we come to that portion of the program that one or two people have actually been waiting for -- and you must really be hard-up for things to do. 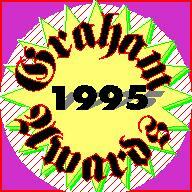 Yes, it's the 22nd Annual Graham Awards, for achievements dubious and otherwise. Many listeners might ask what sets the Graham Awards apart from all the other pointless awards shows. Well, for one thing, we're not on TV, for another we don't spend any money on our awards, and for another we hardly ever bother to notify the recipients. So as far as pointless awards shows go, ours is definitely among them. As usual, these awards are bestowed completely unscientifically, and purely on the basis of personal taste and prejudices by a committee of one public radio guy. This year's "musical chairs" award goes to the major record companies, who shuffled presidents and potentates at a dizzying rate, and still managed to release a lot of bad music. Our "could be arranging deck chairs on the Titanic" award goes to the media conglomerates who are so busy merging that they might not notice that the Internet could sink their whole ship. But then again, the Internet could turn out not to be the iceberg predicted by some, and we could indeed end up with one or two companies controlling all the media everywhere. Our "P.T. Barnum corollary" award, which is based on the principle that even superstars, if they put out an intelligent and tasteful enough a record will die on the charts, goes to Bruce Springsteen and the Rolling Stones. Springsteen recently released a fine album called The Ghost of Tom Joad, a kind of sequel to his Nebraska acoustic album, but with better sound and a small group of backing musicians. It peaked at #11 on the charts in its first week, and is heading back down quickly. The Rolling Stones enjoyable live album Stripped also peaked in its first week at #9, and is also heading down. This year's award for the worst luck goes to R.E.M., three of whose four members required emergency surgery this year. Michael Stipe underwent hernia surgery, Mike Mills had an intestinal operation, and Bill Berry needed brain surgery. The band continues to tour, despite their medical travails. Our "lawsuit of the year" award goes to Michelle Shocked. The music business, packed with lawyers and scoundrels, provides for many a lawsuit each year. Many involve copyrights perceived to be stolen, or litigation between artists and record companies, or even suits like those of Tom Waits alleging commercials ripped off his style. This year's most interesting involved iconoclastic folkie Shocked apparently trying to get out of an onerous contract with Mercury Records. It was a one million dollar lawsuit whose basis was the 13th Amendment to the Constitution, which forbids slavery. It's often said by artists that they become slaves to their record company. This could provide a legal ruling on whether that is literally true. Our "oddest musical trend" award goes to the revival of interest in the music of Esquivel and other arrangers from the late 1950s and early 1960s, in what is now being called "Space Age Bachelor Pad Music." The wacky instrumentals are so hokey that they have suddenly become cool again. Second place in the high-camp award goes to the album Stairways to Heaven, the Australian-produced collection of a dozen versions of the interminable Led Zeppelin opus ranging from reggae to lounge. It was one of those albums of which I had a love-hate opinion. It was great fun the first time, but it's a joke that quickly wore thin. I don't think anyone in their right mind would be able to sit through the entire record without wanting to leave the room. Our award for "the style most mutated in 1995" goes to Celtic Music which has been put in the blender with New Age by people like Enya, mixed with hip-hop and ambient dance music by Stone Edge and performed with the Rolling Stones thanks to the Chieftains. What next -- Celtic lounge music? Our award for the most unlikely pairing of producer and artist was on Emmylou Harris' 1995 CD Wrecking Ball, produced by Daniel Lanois, who added the dark, brooding, spacey sonic textures that has marked his work with people ranging from U2 to Robbie Robertson. Country diva Harris proved her versatility in what turned out to be her best album in years. Our award for the most interesting personnel change in a veteran band goes to Little Feat, who recruited Ms. Shaun Murphy to sing lead on much of their new album Ain't Had Enough Fun, which turned out to be their best in a long time. The group really got funky New Orleans style, and Ms. Murphy, who had sung backup with the group on previous releases, fit in perfectly. Our award for the most interesting departure from the family business goes to Chris Jagger, who went Zydeco on his new album Rock the Zydeco. But he did bring along his older brother Mick Jagger to sing along in spots. Our award for the album most ruined by bad sound and excessive compression goes to Del Amitri's Twisted. Again, the Scottish group I have long admired had good material and an honest, unpretentious style. But their album's sound was so heavily processed that I couldn't stand to listen to the record for more than a few minutes at a time. Our award for going too far in the pursuit of commercial appeal goes to the Pat Metheny Group, who in what could also be described as an artistic challenge, attempted to weave brain-dead hip-hop rhythms with the group's trademark complex, ever shifting harmonic colors. They did it on half the CD We Live Here. The result was half a good album -- the other half. We provide this award as a consolation for being first time in many a Metheney Group release that their album failed to make it onto my top 10. Other disappointments of the year include the Fabulous Thunderbirds' Roll of the Dice which was given more of a heavy rock sound than a blues direction, and the Greenberry Woods, who in 1993 released a fun paisley-pop debut album full of Beatles influence. This year, they went grunge. And now for some of our more serious awards. Our record company of the year goes to Rounder Records, the folk label who celebrated their 25th anniversary this year, and expanded to include Flying Fish records. The company just keeps releasing album after worthwhile album ranging from traditional bluegrass to New Acoustic to singer-songwriters to reggae to blues. They also noted their first platinum album with Alison Krauss. Comebacks of the year include James Brown, who released a great live album that captured the energy of the Godfather of Soul, Steely Dan, who also had an excellent live album, 70s singer-songwriter Steve Forbert, who hadn't been heard from in some time, 60s folksinger Bob Gibson who recorded an album of new songs by Shel Silverstein, Fleetwood Mac, who released a surprisingly tasteful album during the year, and even Gary Wright, of Dream Weaver fame, who returned with a rather unremarkable album, but returned nonetheless. Our award for the most sonically interesting album goes to French vocalist Marc Beacco, who on his 1995 release Scampi Fritti turned the role of singers and instruments upside down. Beacco used multiple overdubs to provide a wordless vocal accompaniment to instrumental soloists, including some outstanding jazz players. The result was fascinating. Our producer of the year award is split two ways. One to Daniel Lanois for this work on Emmylou Harris' Wrecking Ball, and the other to Béla Fleck for his work on his own album Tales from the Acoustic Planet. And now for our albums of the year award. In past years, I have had no clear choice for a single album of the year, This year I do in two categories, debut releases and albums by veteran performers. My pick for debut album of the year is the Foremen's Folk Heroes. Now for my nine other favorite debut albums of 1995, in alphabetical order by artist. And now, ladies and gentlemen, may I have the envelope please. The Graham Award for album of the year goes to Béla Fleck's Tales from the Acoustic Planet. See also my complete Best of 1995 albums list.